Art as Usual: PUBLISHED!!!! Sew Somerset June '09 issue!!! PUBLISHED!!!! 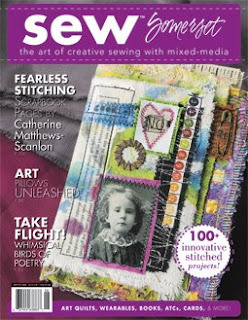 Sew Somerset June '09 issue!!! Yay! Last night I found the newest Sew Somerset in my mailbox!!! It's technically been out all day and it's been killing me to wait for my free copy. I wanted to run right over to my nearest B&N and pick it up!! Funny, I've been waiting for so long and then almost lost it at the end! What a great issue though. I love some of the more colorful pieces-especially the cover piece! It's just beautiful! The quality of work in there has been getting better with each issue I believe and this one might be the best yet. You might not want to rush out and get it like I almost did but you will want to look it over if you've an interest in art quilting, fabric, or some unique mixed media. I have three mini art quilts that were accepted along with a little how-to article. I would have loved to go on about them a little more than I did but they give you a word count you have to stick to. Like the "dream" piece that I told you the background to a couple of weeks ago I think I'll do a couple of posts in the next few weeks explaining some more of the background and inspiration involved in the other two pieces. WHoo hoo!!! It feels very very good to see my work published again!! Yippppppie! Great for you! I have to take a peek this week when I'm at B & N. Great job! DONE! And off on to the next piece!